According to Late Night Shows Lineups, Rob is scheduled to be on Jimmy Kimmel Live on August 22nd. You can get tickets at 1iota. Rob's name not announced there yet. Oh that would be great. I like him and Kimmel together. 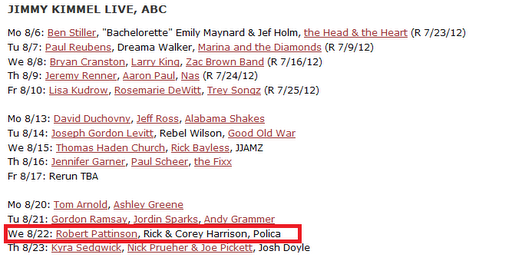 OMG, I also just saw Pawn Stars' Rick and Corey Harrison will be on the show too. Maybe they can get something autographed from Rob, that would make them some money at the store in Vegas. I love Rob on Jimmy Kimmel and he's ususally very nice to Rob and the Twilight cast when there on. 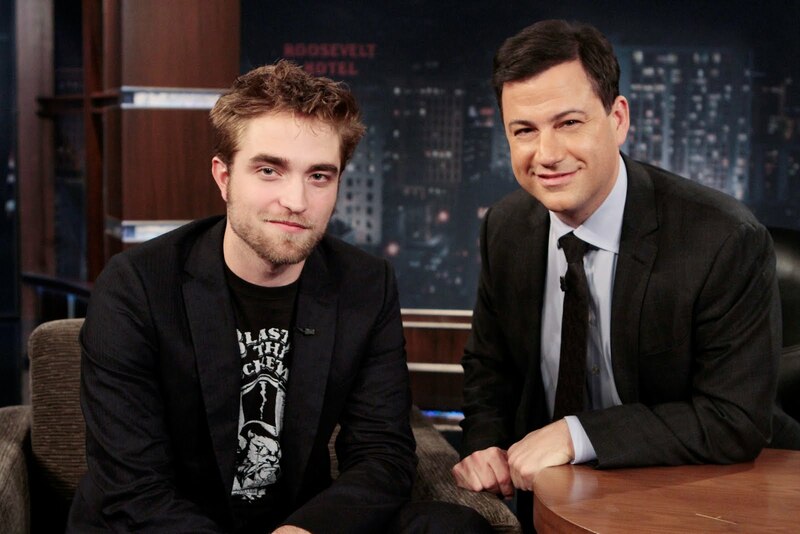 Can't wait to see you on Kimmel rob. It was great the last time the cast was on there!!!!!!! Omg... I am going to see rob on Monday!!!!! @No name at the premiere or The Daily Show? Rob, I pray for you every day. I pray that starting this coming Monday you will have all the good you deserve and all the good that life has to offer you for the rest of your life. This is your mile stone, and it is just going to make you stronger in the end. @lluvthemovies..... All his appearances...I know rob is an intelligent guy and he can take care of himself, but it does hurt to send a little prayer his way. I get the feeling rob depended on her a lot, and has not done too much on his own without her imput. So I think next week will be crucial for him to grow on his own. @lluvthemovies....Oh I am sorry, I didn't mean I was going to see him physically in person....I mean I am going to see his face finally on the tv. Sorry I misunderstood your question. Rob no matter what is been printed out there ALLL WAYS REMEMBER YOU DID NOTHING WRONG. There are people who are trying to turn the table around on you but don't let it get to you. They are getting desperate and they want to salvage her career and they don't mind sacrificing your, Inorder to get hers back on track. This is the only option they have left, that's to try and discredit you, and write viscious lies about you. Stay strong and hold your head up high no matter what. Please stop hiding and show yourself more so they see you have nothing to be afraid of. non-mainstream represents the younger generation thoughts, Breguet replica This activity can exercise our diy ability activities should look to attend Hublot replica watches.